This olive oil press was in a Turkish store that sold olives and olive oil, in a small town on the Aegean sea. 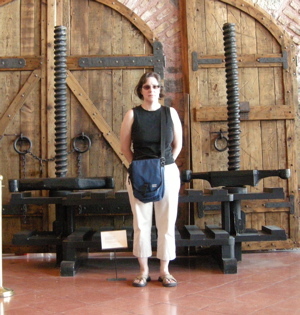 It is interesting for it’s similarities, and differences, to our modern book presses. 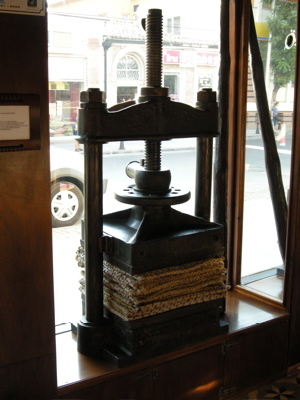 Structurally, it is more similar to a book press than a copy press, which many bookbinders also use. First of all, it is like a book press on steroids–look at the thickness of the platen, and the massive collar where the screw is threaded. A nice touch are the thick washers at the top of the uprights, which were never on my Hickok 001/2. With metal, a nut should always be used with a washer to prevent damage. There is no hand wheel, the barely visible press pin (is something this large considered a press pin?) on the right of the photo is about 5 feet long, and there is a brass ferrule that fits into the slot pictured below. 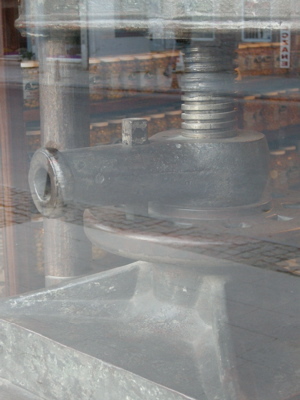 Since the tightening occurs inside the frame of the press, rather than on top, it looks like the two platens could be closed without adding pressing boards. The depth of the castings reinforcing the upper platen is also evident. Sorry for the annoying reflection– I wasn’t about to try and move this baby. The angle of the acme threads seems roughly equivalent to a book press. It would be laborious to raise and lower the platen, because the press pin can only rotate about 160 degrees. Then the key (a square peg near the screw) would have to be raised, the pin rotated back to its original position, the key reinserted, and another half turn performed. The multiple holes to receive the pin are barely visible, forming a circle around the screw. Presumably, the olives were stacked in such a way that avoided having to raise and lower the press very far. I didn’t find any manufacturers marks, but most objects I examined in Turkey was made there –from glasses to cars. 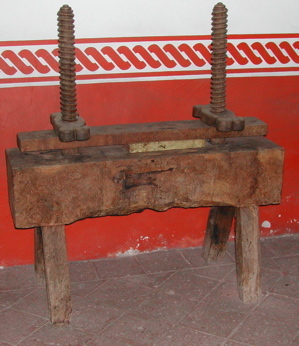 This wooden press, also labeled for pressing olives was in the Roy Koch museum in Istanbul, which specializes in industrial artifacts and the history of technology. The threads had an odd, rounded shape that didn’t appear to be caused by wear. The dumbbell shaped tightening knobs look like they could generate a fair amount of force until the friction from the wood would stop the tightening. It also looks like two people would work together to tighten the press, which would be fun to synchronize. And then to sample the fresh, first cold pressing…. Earlier, I found a somewhat similar press in Mexico in a small bookbinding museum. Many of the artifacts in this museum, in my opinion, were from leather workers, not bookbinders, but there is a great deal of interchange. These presses are a bit like a large lying press, with German style tightening nuts, permanently mounted upright. 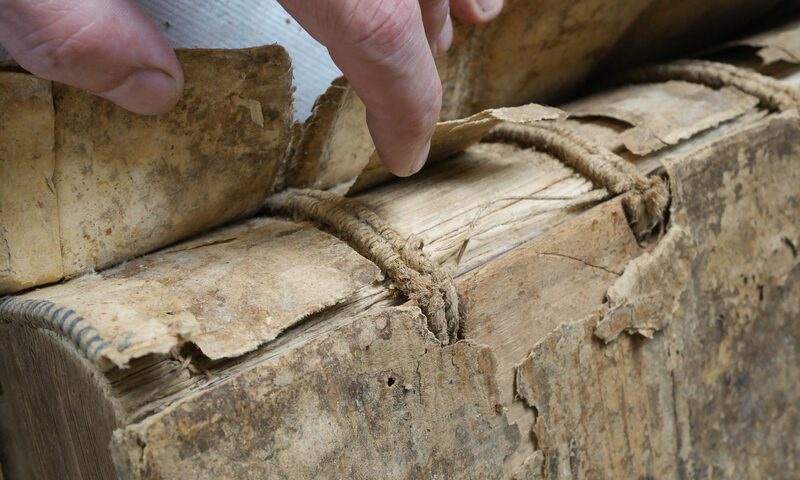 I’ve never seen anything like this in North America, although many binders use various types of fruit presses that have been adapted for book use, although these are usually the central screw variety. The difference between the size of the upper and lower platen in this photo is somewhat surprising– it seems the upper one would immediately start to deflect when it was tightened. I can’t seem to find the address, but I suspect if you try contacting some bookbinders in au, a well made metal standing press would work. Just look for one with low tread pitch, or even a Vagelli, with it’s percussion mechanism could easily flatten the toughest olive.